Each module allows you to retrieve users list, group members, password hashes... and others specific information. Password hashes can be audited in order to identified NULL or Trivial password. IMA respects the "One Click" concept. It will use, as possible, current credentials and automatic process for the audit. IMA is Free software, may be Open Source...(C# Application). This sofware is written in C#, so the .NET framework 2.0 Service Pack 1 is needed. Currently, only the MS Windows and MS SQL Server modules are available. At the moment two versions exists: Full and Lite. Note: John The Ripper & PwDump embedded may be detected/blocked by some antivirus as "Hacking Tools"
Active Directory Users, Groups, Shares, Services and Password Audits (Windows LM and NT Hashes). 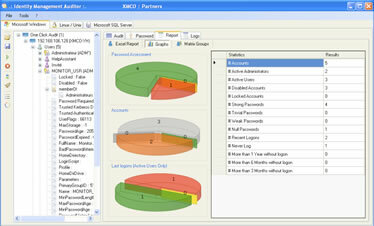 MS SQL Server Users, Roles, Permissions, Databases and Password (SQL200x Hashes) Audits.